To change the screen resolution in Windows 7, you need to use the Screen Resolution dialog box that can be opened via the Control Panel. 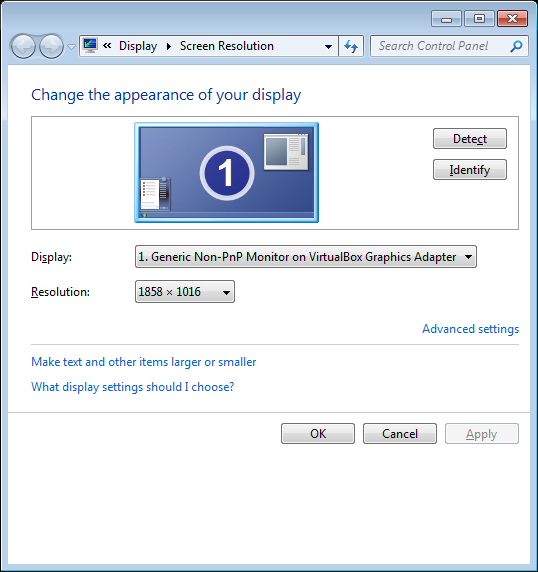 Use the following steps to open the Screen Resolution dialog box. 3 – Click on Change desktop background. This dropdown menu shows you the currently selected screen resolution on your PC and allows you to change the screen resolution settings. Click on the Resolution dropdown menu to reveal the adjustment slider bar. Move the slider bar up and down to change the settings. Notice as you move the adjustment slider bar up and down, you can see a mini preview of the new settings in the screen above. Once you’re happy with your new screen resolution settings, click on the Apply button to save them. You will then be presented with a confirmation box asking you whether you would like to confirm the change or to revert back to the previous settings. Whilst I can show you how to change your screen resolution, I cannot tell you which is the best resolution to use. It depends on both the monitor you use and your personal preferences. Play around with the different settings and decide which best works for you.